This summer, 75% of the staff and students in my entire school district will relocate to a new building. It is the final stage of a K-12 reconfiguration plan that has been in the works in Quincy for over a decade. This means fewer building transitions for students, smaller elementary schools, and better relationships for students, staff, and families all around. Not to mention more robust programs in middle school, and an expansive new high school. Right before break, the elementary staff learned our new assignments. I am slated to remain in my current role, but many of the teachers in my building have been re-assigned. My colleagues, friends, and mentors. Instead of five teachers per grade at my school, there will now be only 2-3. That means automatically over half of them must move out. It was expected. But seeing it on paper is a different kind of real. Oh, and remember, we also have a new education funding model in Washington State. There is lingering uncertainty surrounding those funds, a levy on the ballot, and a new elementary school opening. These are not small moving parts that impact our elementary academic programs. Does this mean our programs will get to create new opportunities for our students? Can Quincy even afford full time specialists at each school? Or will specialist teachers need to take on other roles? Will all stakeholders share in these decisions? All of these questions remain to be answered. As you can guess, it’s been a bit heavy around here. And I have been caught up in it as much as anyone else. Until I talked to Bobbie. As an instructional coach, she is one of the last who will find out her new assignment. And yet when we talked, she seemed above the fray. She has been through a major school reconfiguration before, and she is ready. Yes. This is going to be hard. We will make some very big mistakes. Some of the best things about our school will be lost. AND we are doing this for a reason. Our role is to help get everyone through this. To remind them why we did it. We are the ones to remember the great things, and to help to bring them back. This is the best move for our kids, and this IS going to be good. As I listened, I realized--this is leadership. Above her own job, above her own program, above the work she has spent a career building as a coach and a teacher. Despite whatever mess we will invariably make, she has an unwavering focus on the bigger picture. In the weeks since, that conversation has settled over me like a blanket. I am lucky to be staying at a school I love, in a job I love. Over the last five years, the enrichment program in Quincy has developed into something I am immensely proud of and extremely protective over. I have spent the fall grasping at that truth, fighting against the coming changes and how they may negatively affect this work we’ve built. But I finally see the bigger picture. We are doing this for a reason. My role is to help everyone get through this change. To keep our best memories alive, and to help bring them back. This change is best for my students, and this IS going to be good. I became a teacher to help make Quincy a great place to live and learn. It is time to put aside my anxiety and agenda. It’s time to lean in to the coming changes with optimism, hope, and perseverance. 2019 is a time to lead. I don’t know if it was the end of my first full week as a working mom, or the end of the Tacoma Teacher Strike, or something else. But I woke up on Friday and I just knew. 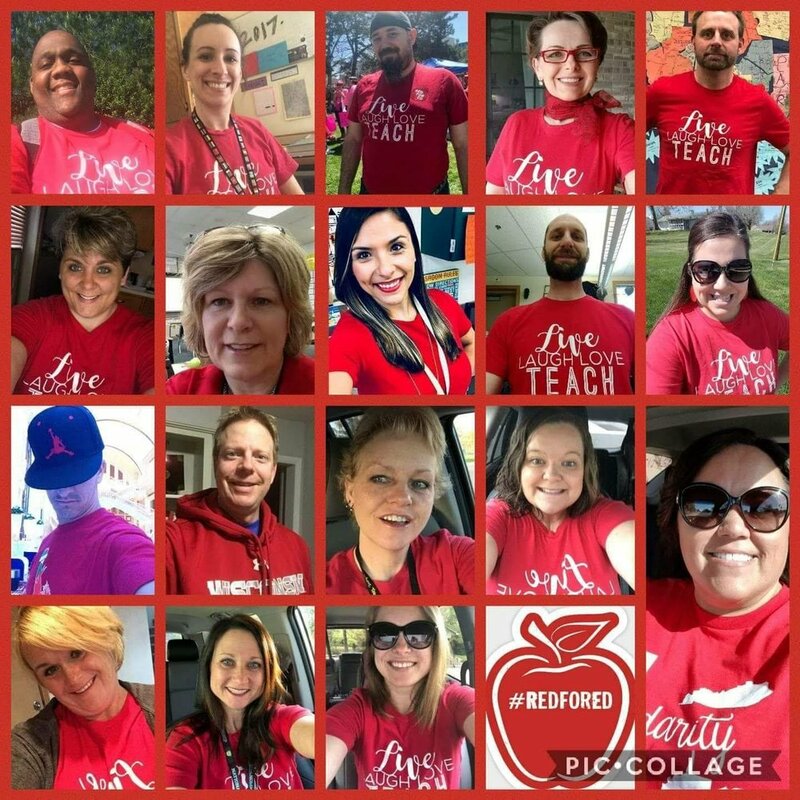 It was a day to be #RedforED. This movement is about the promise of public education. It is about supporting each other--teachers, families, students, and communities--while we do hard things to make this promise a reality. It is about the promise of something better—for our country, and each individual child. When I woke up on Friday, I just needed to be in it, and I needed to write to tell you why. In the last year I learned a new meaning to my mantra to do hard things. I had a more difficult than average pregnancy, and it was HARD to go to work every day. I learned a new world of respect for pregnant ladies everywhere. I had a more difficult than average recovery, and it was HARD to do… everything. I learned a new universe of respect for new moms, especially the new moms in our country who have to go back to work before their own bodies have healed. Just as I found my voice to advocate for kids, just as I was catching my stride as a writer, just as I was learning to lead, my body shut down. This is the first time in a year that I have been physically capable of doing the work I want to do. And it feels so good to be back. I’m full of energy. I’m #RedforEd. State Teachers of the Year are #RedforEd. All over Washington this fall, teacher’s unions have stood up to school districts to demand the pay increases which the long-fought McCleary battle intended to provide. Across the country, teacher rallies and strikes have made news throughout the spring and summer. Last week, Time Magazine featured a series on the state of teachers in America, and those stories left me heartbroken. But also grateful. In Quincy, our teachers and the district reached a contract agreement waaaaaaaaay back in mid-July. Plus I finished my Master’s Degree this spring, which gave me an extra bump on the salary schedule. When I put them together they add up to a whopping 35% raise over last year. I became a teacher in 2010, in the midst of pay cuts and hiring freezes. It was a time of “you get what you get and you don’t throw a fit”. That mentality has stuck with me. There are so many things to stand up for as a teacher; I never thought to take time to stand up for myself. I remember vividly the moment in July when I realized what my new salary would be. I was standing at my kitchen counter. My mindset changed in an instant. I stood a little straighter and thought, “Yeah. I am worth that.” I gained a sense of self-respect I never knew I was missing. And I realized teacher pay is a battle worth fighting for. I’m so thankful to the teachers, in Quincy and around our country, who have taken a stand on this hard thing for me. I’m so glad I work for administrators and a school board who care about our students enough to care about their teachers. I’m full of gratitude. I’m #RedforEd. Having a baby right after my year of service as Teacher of the Year left me in a strange dichotomy. Those two experiences are among the best of my life. I’ve never felt so fulfilled, challenged, and inspired. At the same time, they removed me, physically, from my building and my peers. In the last three years I’ve had three principals, two program directors, and 12 different teaching teammates. My absence, combined with this turnover, left me anxious and lacking direction. I’ve never felt so isolated. My new colleagues, while new to our department, are natural leaders. They are quick learners, visionary thinkers, and personally invested in our success. Each of them has already solved problems that I have unknowingly been stuck in for years. This one thing is a little less hard for me, because of them. And what’s more, my students are going to have a better experience this year, because of them. I’m full of hope. I’m #RedforEd. Teachers always talk about the need for our students to have role models they can relate to. I totally identify with that right now. On the farm, it is pretty uncommon for a spouse to have an external career when kids are involved. 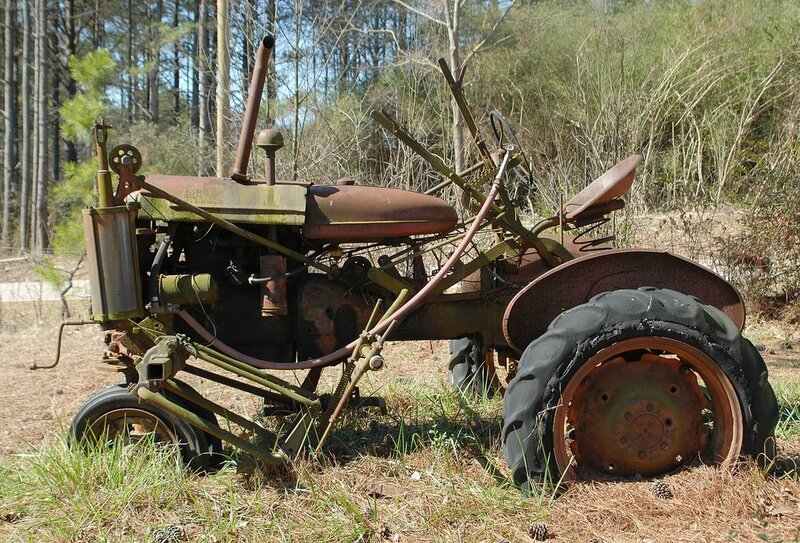 Farm life is unpredictable and all consuming. I don’t have any footprints to follow. But I’ve been determined to find a way to do this hard thing. I see the struggle as an investment in my family, as much as a paycheck, a career, or a service to my community. Until we had a major farm emergency. The day before harvest started, a week before my maternity leave ended. I could hardly separate the trauma of the event from my bigger feelings about being a working mom. I panicked. How am I going to make this work? Then I listened to Robert Hand accept his title as 2019 Washington State Teacher of the Year. With every sentence, he pulled me back to myself. He reminded me who I am and why I do what I do. “And I said to my little children, I'm going to work and do everything that I can do to see that you get a good education. I don't ever want you to forget that there are millions of God's children who will not and cannot get a good education, and I don't want you feeling that you are better than they are. I am a mom, a farmer’s wife, and a teacher. I’m full of purpose. I’m #RedforEd. I am not supposed to have favorite students, and I don't, most of the time. My favorite part about teaching is learning to see what makes each of my students special and unique. But, I will say, one little boy has burrowed his way especially close to my heart over the past three years. The best way I can describe him would be to say that he is curious, caring, and just a bit mischievous. He has hopeful eyes and a bright smile. He warms up every room he enters. In Kindergarten, I overheard him exclaim to his team, “No, guys, not that idea! Mrs. Jones wants us to be creative!” I’ll never forget the way his voice squeaked when he said creative. I melted on the spot. In that moment, my heart cracked a little, but the election was months away. I brushed off a twinge of worry, and we went back to reading Sideways Stories from Wayside School. Soon we were both laughing again, our cares forgotten. Then, you won. Instantly I again heard his voice in my head. Many of the people who love me the most, who taught me what’s right and how to care about others, they all voted for you. I wanted to hope in you because they believed in you. I tried to brush away my worry as it returned, but it was more difficult. Those eight-year-old eyes started keeping me up at night. 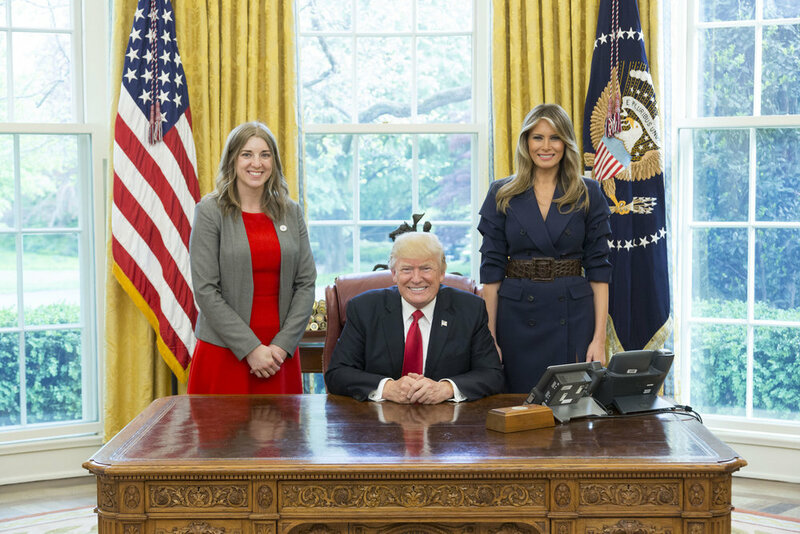 In April, I stood with my friend Ricky, Illinois Teacher of the Year, when we visited you in the Oval Office. He asked you to take care of our DACA kids. You promised him that you would. I took that promise for myself and for that squeaky little voice in my head. As soon as I saw the headlines reporting your intention to end DACA, my head went back to that moment in the White House. Where went my heart? To this little boy, to the other undocumented children in my classroom, and to the hundreds of thousands of Dreamers around the country. I do not understand this decision. I also cannot understand the timing. The school year has just begun, and teachers are barely starting to show our students that we deserve their trust. To assure each one that they are safe and respected in our classrooms. My job is to push students out of their comfort zones, to teach them to embrace risks and challenges at school. How can I do any of that when their minds are full of the risks and challenges they bring with them to school? In my STEAM Lab, I help students see that they can reach for many different dreams in life. We engineer, experiment, and create. I’m urgently preparing them to be our country’s leading problem solvers, business leaders, innovators, and citizens. America is their home, and they have the potential to make it great. What will I say to this little boy when I see him tomorrow? He’s in third grade now; a critical year. This year’s success or failure has the power to write so much of his future. I know he’s already carried this anxiety for a year now. How much learning has been lost to fear? How much more is yet to come? I am not a politician or an immigration expert. I am a teacher. I am the keeper of the children--their silly faces, their squeaky voices, their inspiring stories. I stand in front of them every day, helping them make sense of a world they do not understand, one that they did not choose. If I can’t make sense of this, how will they? Mr. President, please. Protect our DACA kids. At "The Table", Where Are All the Latinos? In the farm town where I live, over 90% of students are Latinos. In classrooms around the US, Latinos include 25% of all students, the largest minority group. In the world of educational leadership, they are noticeably absent. I search for traces of my students wherever I go, hoping to better understand, relate to, and support them. Too often I find myself asking, where are all the Latinos? As I struggle to wrap my mind around this disparity, I get a sense that Latinos are a hidden class in this country. If America was a car, they would be the engine. Grinding away, unseen, much less understood, by most of us who benefit from their efforts. When I hear people talk about immigrants taking American jobs, I see families of my students, doing jobs no one else will do. I’ve lived on a farm my entire life. Modern farming requires hundreds of people to get the job done. The only non-Latino/a people I've seen picking cherries, pulling weeds, or sorting onions are the children of white farmers. I’ve felt their silent presence when I travel, too. In hotels and restaurants, a world of people race around, unseen, leaving their shadows behind in the form of a freshly made bed, a spotless glass, or a clean table. Yet when we think of where our food comes from, or why our travels are so smooth, we rarely remember those behind the scenes, making it all possible. This summer, I was reminded of how hidden Latinos are, even in education. It hit me when I attended a conference of the National Network of State Teachers of the Year (NNSTOY). The coordinators clearly tried to emphasize equity and diversity. Many sessions were led by people of color, significantly more than I have seen at other education conferences. Even so, I counted the Latino/a attendees and speakers on one hand. I left the conference frustrated, again asking, where are all the Latinos? I know others whose leadership still deserves to be celebrated. People like Eva, my first mentor. Or Letty, who has been a leader of my school for years, both as a paraprofessional and as a teacher. Or Michelle, Maria, Maria, Ana, Alex, or Manny, who teach me through their actions as well as their words. These voices guide me. I hear my students when José shares about his childhood as a chronically tardy student, spending long morning hours picking asparagus before school. I feel them when Gloria talks about the discrimination she’s faced at school, even as a teacher. I also know these friends aren't the only Latino/a leaders out there. At this conference of our country’s “most accomplished teachers”, I kept thinking, where are all the Latinos? The truth is, there were Latinos at NNSTOY. Just not sitting in the audience or speaking from the platform. After they served us lunch and cleaned our rooms, we talked about their children behind closed doors. Each time I thanked the servers for my meal, my discomfort grew. Were they looking around the room and thinking it too? Where are all the Latinos? I finally wrote to Ricky, the Illinois Teacher of the Year. I thought it would encourage him when I said, “NNSTOY needs your voice, so bad.” He understood my frustration but went on to tell me about the summer camp he runs, about his daughter soon to have surgery. I understood that right now, his efforts are needed at home and in his community. I felt guilty for adding to his burden. 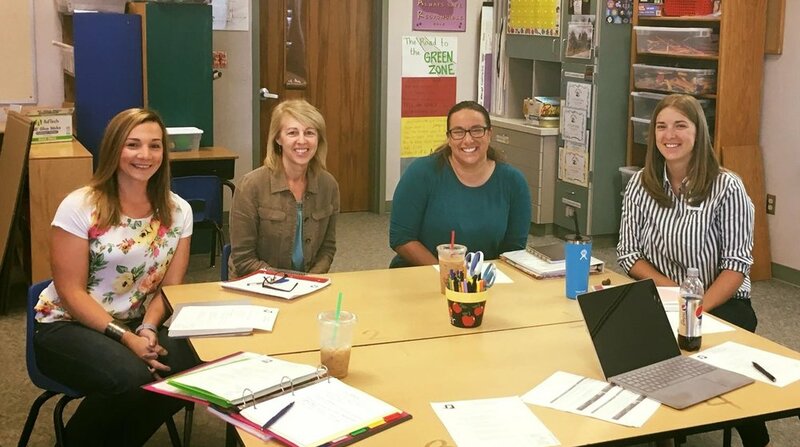 On the last day, I came across a blog post about a group of teachers who met with Secretary DeVos the day before the conference. The post praised the diversity of the group (although still, there were no Latinos). It talked about the “invisible tax” that black teachers pay, one that forces more leadership on them than they are due. I thought again of my conversation with Ricky and reflected on how this tax is imposed on teachers of many different groups. I wiped tears from my eyes and asked myself again, where are all the Latinos? Since that week, I’ve often found myself thinking back to words that Clint Smith shared with us there. He reminded us that we must hold the truth equally in two hands, the good and the bad. Because reality is both. Only, I need a lot more hands. Yes, Latinos are underrepresented in the teaching profession. Yes, some have been lauded for their work. Yes, they do bear an extra burden. Yes, we need their voices to help us understand our Latino/a students. Yes, those accomplished voices still remain hidden to most of us. So, where are the Latinos? Maybe that’s the wrong question. They’re the biggest minority group in the United States. They’re my students, friends, mentors, and colleagues. I know where they are. I depend on their perspective, but I don’t hear it enough. And, how do we listen? Check out the book Courageous Conversations About Race, by Glenn E. Singleton. Thanks to Lee-Ann Stephens & Melissa Collins for inspiring this post during your session on Courageous Leadership at NNSTOY. The most difficult part of writing this piece was selecting a word to identify a group to which I don't belong. I finally settled on the term "Latinos" after many conversations and much advice from the friends I mentioned above and more. The ways we define ourselves are deeply personal, and I have learned so much this last few weeks. If you are interested in joining me on this journey to understand why people identify themselves the way they do (Latino, Hispanic, Chicano, Latinx, etc), check out these great pieces from Dieste, NPR, or Huffington Post. Or better yet... ask someone you know! I never liked being a girl. I’m pretty sure this was because deep down I knew how hard it was to be a girl like me. I loved dirt, Donkey Kong, and Ken Griffey, Jr. I dreamed of playing major league baseball, becoming President, inventing better computers, and collecting rocks on the moon. I bet you know what I’m talking about—these are the kind of dreams that people smile at, but don’t take seriously. Especially because we’re girls. Now I’m a teacher, and I love it. I didn't forget my childhood dreams. I never learned how to make them come true. I thought it was enough to love something so much. I loved computers for as long as I can remember. I was sure that I would grow up and work at Microsoft. Did I take any computer science classes in high school? Nope. Too shy. Those classes were full of boys I didn’t know. I finally enrolled in engineering classes in college. Did I feel intimidated? Yep. Did I persevere? Nope. The end. If I could go back and change one thing about my life, that would be it. I don’t regret where I ended up, but how easily I gave up. If you’re one of my students reading this, you probably don’t believe me--we talk everyday about doing hard things! The thing is, I didn’t learn to do hard things until I was a grown up. At least not to do them on purpose, anyway. When I decided not to become an engineer, I had a hard time finding something else to do. It took another five years before I decided to become a teacher. But the funny thing is, now that I am a teacher, I can’t imagine doing anything else. I love teaching because it taught me how to do hard things. I realized I couldn’t give up, because kids were counting on me. I love teaching because I get to teach you how strong and brave you are, before your choices get so big. I love teaching because I can help you learn to love the things that scared me. We experiment with chemistry and physics, drawing and painting. I love teaching because I get to show you the joy in the things I still love to learn about. We test rockets, write code, and dig in the dirt. We plan your path to the presidency. You know what else? The dreams I had when I was your age have come true after all. Just not in the way I thought they would. This spring, I met Bill Gates and visited the Oval Office. Soon I’ll go to Space Camp and throw a pitch at a Mariners game. That’s the thing about dreams. They sometimes sneak up on you. So, girls. As you grow up, remember that you are strong and brave. Take hold of your dreams. I can’t wait to watch! You might just do something that’s never been done before, because you are a girl. Isn’t that cool?! I have one more secret to tell you. Ready? I decided that being a girl isn’t so bad after all. I am not a STEAM expert. Science intimidates me. In school I was good at math… but that just makes it harder for me to teach math. On paper, I wouldn’t appear very qualified for this job, but I don’t care. I actually think that’s how the magic happens in my classroom—I learn alongside my students, every day. For example, art. I can’t do art. Agh, fine. Fixed mindset, yada yada. I can do art, I just haven’t practiced enough. And I have gotten better over the years. I’ve eased in, thanks to the magical Pinterest land for teachers. Until this year when I realized my assignments leaned a lot more toward crafts than arts. Kids walked away with a few cute posters, but few skills to build on. So, I decided to throw out all my lessons and start over. My goal: teach them skills that transfer and grow. I decided to start with the fundamentals of drawing. I shared the importance of concentration, how to see an object as a collection of lines and shapes. Then we applied our new skills by drawing a carousel horse. A challenge for all, but that’s my job, right? Every day I stood in front of a new batch of third graders. I smiled through clenched teeth as I failed to draw anything resembling a real animal. With an embarrassed laugh, I exclaimed, “You guys. I’ve been trying to draw these legs all week, and they just keep getting weirder!” The kids giggled with me. I cringed as I turned to add the tail. Every day my students followed my lead. With nervous eyes, way out of their comfort zones, they made mistakes and kept on drawing. They laughed, cropped, added, painted, created. Most of their horses turned out as disproportional as mine. They found ways to modify them into something unique, something that made them proud. That lesson is now one of my favorite memories. There were no students or teachers, only a group of people, trying to draw a horse. In the past, I’ve seen, and done, the fake-mistake thing teachers often do. I’ve wondered if kids even buy it. This lesson was different. It was real. I sensed our relationships change, the trust grow. I wasn’t the leader. I was barely even a facilitator or guide. I was part of the team. I am not an expert at STEAM, or art, or anything. That's ok with me. I’ve learned that the most successful moments in my classroom are not when I’m modeling a lesson, but when I’m being a model learner. The world is changing so fast—there’s no time to learn now, teach later. We’re all becoming less qualified by the day, so I embrace it. I'm an unqualified teacher who hopes to inspire quality learning. When you hear the word gifted, what is the first thing that comes to mind? Exclusive? Discriminatory? Subjective? You’re right. Historically, gifted and talented education has left behind many more students than it has lifted up. But the future doesn’t have to be this way. Supporters and opponents want the same thing. To help every child become the best version of themselves. To share all they have to give. We are NOT doing that now. But we can. Gifted is a dirty word. It instantly puts a line in the sand; it alludes to greater value; it is embarrassing. I wish we had a word that better represented the students it labels. Students developing far from the norm of their peer group. They are outliers in development, even within their own bodies. Often with emotions too big for their brains, or brains too big for their emotions, they struggle to understand themselves and the world around them. Does that sound like a gift? We can’t let our language keep children from the support they need. These students are at-risk, too. The vast differences between gifted programs also makes communication muddy. Some districts offer separate schools, or mini-schools within schools. Others cluster gifted students into general education classrooms. Some divide them up as much as possible, offering gifted students as role models. Other districts pull them out of class weekly for an hour, or a day, while others provide no support at all. It is hard to speak clearly about the issue when our undertandings start in such different places. The selection process for gifted programs is even dirtier. In Washington, each district chooses its own criteria for anointing students as “Highly Capable” (our attempt to clean up the dirty word). This flexibility, in theory, is a good thing. It allows us to compare students of similar experience, and some districts have used this freedom well. However, most do not. They set arbitrary cut scores and call it fair. Many rely on parents to recommend students. Or teachers, untrained to understand the many dimensions of giftedness. These methods set the stage for the Big Problem, inequity. Equity is hands-down the dirtiest word in gifted education. Almost all subgroups of students are WAY, WAY, WAY underrepresented. Everyone knows it, and almost no one talks about it. If you think it’s coincidence, spend five minutes in my classroom. My enrichment classes are full of kids typically left out of gifted programs. Low income, English learning, students of color. They will amaze you with their insight, perspective, and talent. Students like mine are in every school, waiting for someone to give them a chance. If we’re serious about equity, we must have it in our most elite opportunities. To summarize these articles, I’ll say this. Schools need to stop seeing students only as they are, but instead, as they could be. We must support the strengths of all kids, early. My district models this philosophy by embedding our Highly Capable Program inside a Schoolwide Enrichment Program. It starts in Kindergarten. As an enrichment teacher, I get to seek out and support the abilities of every student in my school. Every time they rise to my challenges, I push them to do more. As a result, students often surprise themselves, and me, by what they achieve. Raul’s story is a perfect example. Frankly, he drove me nuts. He caught my attention often during class, usually by painting the chairs or shouting at students across the room. I had no idea what he was capable of—until the screening. We screen all third grade students for our Highly Capable program. For Raul, it was the first place we saw a glimpse of his potential. He shocked us all when his score surpassed the 90th percentile on the numeric and spatial reasoning sections of the assessment. We pulled him into my advanced math class the very next day. Still not learning my lesson, I ignored his flailing hand for most of the period. I “knew” he was going to say something “smart”. When I finally called on him, he did say something smart. Really smart. He taught me a new way to do multi-digit division. Mentally. A few weeks later, Raul’s team scored first place at a third grade math competition. Later that spring, he qualified for our Highly Capable Program. The point is, today, he’s in fourth grade and seeks out opportunities to challenge himself. He walks through the school, at peace with the world, a happy smile on his face. Raul is a completely different kid than the one I thought I knew. His life changed because we were looking. We gave him a chance. Gifted doesn’t have to be a dirty word. Or if it does, let’s pick a new one. That is not what matters. Kids matter. Raul matters. We have to believe in, find, and grow student potential. Whether they are “gifted” or not, we have no right to limit what students can achieve. A few years ago, a team of principals and school board members visited my classroom. During their visit, my students cut paper skeletons while I distributed their weekly stack of parent flyers and assignments. It was madness—messy, loud. I called kids up for their papers over the rest of the ruckus. It didn’t look much like learning. It was real. My principal was concerned that I didn’t teach a lesson during their visit, but I stood by my decision. I knew I could back it all up—either with standards or suggestions. I wanted to let them see my real classroom. Routine procedural stuff really takes time in an elementary class. Lately, I have been the observer. All over Washington State, expert teachers have welcomed me to their urban, suburban, and rural classrooms. I’ve visited different grade levels, content areas, and specialized programs. These travels have filled me with pride and hope. I’m honored to be a part of the teaching and learning in our state. We have so much to celebrate! However, I know I’m getting only one side of the story. I watched spring learning exhibitions in Highline. A seventh grader spoke openly about her insecurities in learning. She stood in front of her classmates, parents, and teachers. They asked her hard questions and gave her honest, critical advice. Together they created an action plan for the next term. Amazing. Mt. Vernon uses the English Language Proficiency Assessment to help identify English learners for Highly Capable Programs. They taught me that the rate of language mastery can predict cognitive potential. Yep, so doing this in Quincy next year. In Odessa and Toppenish, third grade feels like family. Both teachers happened to invite me during lessons on fractions, normally one of the most painstaking units of the year. But not in these classrooms. I could feel the trust in the air. What I've been less privy to are stories like this one from my school. Last fall, our counselor quit the week before school started. We were unable to find any qualified applicants to replace him. Nearly all my students come at-risk, marginalized, low-income families. The school counselor provides critical supports for them, especially now. Teachers attempt to fill the void. We stop teaching and tend to their basic needs. We know kids can’t learn when they’re anxious, heartbroken, or angry. But we feel guilty anyway. We’re still failing them, only differently. This is real, problematic, and important. I can tell this story. But my task is to speak for all of Washington. Tales of struggle cannot come only from my experience. I need to understand your real stories, too. So, educators. This challenge is for you. Show me your leaky roofs. Invite me to your struggling schools. Share your failing moments. Let me see your real. Help me tell your story. In Part one You heard Jessa's story. Now, her teacher's Version. I'm proud to introduce my friend, 2017 Northern Mariana Is. Teacher of the Year. Mr. G, Take it away. “Could this dead-end coral road lead somewhere?” I asked myself on August 4th, 2015. Dusk was settling in over a recently destroyed island and I was driving water jugs up, up, and higher up, into the hills of Saipan. Two days previous, Saipan was devastated by Typhoon Soudelor. Saipan is the heart of typhoon alley, where nature eats tin; Jessa lived in tin. My home is concrete because I am rich - I’m a teacher. In Saipan a bachelor’s degree buys you a concrete house, bold in the face of a typhoon and resolute in a debris field. But Jessa’s house, at the dead-end of that coral rock road, was a barracks with 17 people living in plywood and tin. This type of home is temporary shelter for guest workers on Saipan, workers like Jessa’s parents who have been temporarily living there for all of Jessa’s life. Jessa is dainty, clever, and dances to music nobody else can hear. She was my student at our small island high school. She was one of the founding members of our Million Dollar Scholars Club, designed to support young scholars as they leave the island and go to college. Just two weeks before Jessa’s senior year, Soudelor took her school clothes and threw them into the jungle along with the rest of her house. Jessa was inside as her home was destroyed, she was nearly killed. A few days later, sitting under a bent piece of tin at dusk, I found Jessa in her typhoon demolished house, and she was thirsty. I asked Jessa’s mom to please consider saying “maybe” instead of “no”. I told her that I would send her to college, I promised her, and that it would cost them nothing. It was a hollow promise, I had no idea how I would follow through with it, but Jessa’s mom said, “OK, maybe” and that was enough. Over the next year Jessa’s parents re-built a home around her as she studied and wrote scholarship essays like the one you likely just read. Jessa went months without electricity or running water as she studied for advanced placement exams and applied to universities. One day a letter came from Central Washington University: an offer of a 4-year full-ride scholarship. We paid for Jessa’s flight with donations and Jessa moved into her first strong home: a college dorm. For each of my students to leave Saipan, it costs $1500. The price of the flight, passport, application fees, dorm room deposits, and more, must all be paid before a Pell Grant is awarded or a scholarship is given. This $1500, in many cases, accounts for two months of wages for our families who are surviving poverty in the farthest away arm of the United States of America. Nearly all of my students come from poverty, many families do not even have a bank account, but each of them can have access to higher education because we prepare them, raise the money for flights, and send them to colleges where scholarships await. My 23 scholars, from the most disadvantaged high school in the region, claimed more than 2.5 million dollars in scholarships last year. But beyond the numbers, Jessa will never again live in a home of tin and plywood. Her dead-end coral road led somewhere, it led to college. In recognition of my work with Jessa and her peers, I was honored as the 2017 Teacher of the Year for the Commonwealth of the Northern Mariana Islands. When I travelled to the continental U.S. for a conference in February, I met Washington State Teacher of the Year, Camille Jones. I told Camille about Jessa, and Camille immediately said she wanted to help. A mere couple of weeks later, Camille was buying Jessa dinner, lending encouragement and mentorship to an island girl very far from home. Now in year two, our work continues. With 26 more scholars preparing to leave Saipan for college this August, I am once again raising funds. Because if Jessa can escape poverty and pursue a college education, so can Kloe, Andrea, Cory, Jose, Brittany, Erica, Shania, Tiyani, and the rest. This is the work that we teachers do, the best job in the world. Gerard Van Gils teaches College Preparation at Kagman High School where he created the Million Dollar Scholars Program. He lives on the island of Saipan (Northern Mariana Islands) with his wife and two daughters. He doesn’t own socks. Recently I met an extraordinary teacher, who introduced me to an extraordinary student, who graciously agreed to share her story here. I've been sitting here for over an hour trying to think of a metaphor to describe the sound of my tin roof tearing in half. While I cannot forget the sound of Typhoon Soudelor turning me into a refugee, I cannot describe it either. The problem with tin roofs is that they only hold water out if they aren't pierced. To nail the sheets of roofing down you have to pierce them. Then the rust attacks, the holes get bigger, and soon the typhoon throws it into the jungle. In our case, the tin tore off, but also took pieces of the roof beams with it. When the typhoon hit, my home transformed from shelter to assailant. Glass shattered and looked for our eyes, wood splintered and scraped our naked feet, and the tin tried to cut us in half. The people in our barracks, a large multi-family home, ran in different directions but many of us still ended up in the bathroom. We didn't dare to sit down because if the roof came off the bathroom next, we all had to be ready to run. That long night, August 2, I calmed my fear by focusing on how I someday would leave this island. They call us survivors but we are just getting by. The mosquitoes are survivors, with vigor, making us their buffet. Most of the island, including our re-built tin palace, has no power or running water two months later. There's no internet within five miles of my home and the car is always on empty. I haven't slept on a bed since mine flew out of the house; we sleep on the floor of a hotel ballroom because they allow us to stay for free as long as we leave by 7am. Since the typhoon, we have to line up for everything. We waited four hours to fill up the car. We waited at five in the morning to get a bag of ice because we are just desperate for a cold drink. We wait still for a new shipment of roofing tin to arrive. We wait for some sort of financial assistance from anyone but we get none because FEMA is for citizens and my parents are from the Philippines. Day one of school, the teacher hands me a school supply list, as though my parents would choose to buy me paper notebooks instead of roofing nails. Kids in concrete houses showed up in new school clothes, I came to school wearing the only clothes that didn't fly away in the storm. School starts in the dark, with no internet, and I'm expected to turn in scholarship applications and write essays as though I have the same advantages of kids my age attending prep schools in the United States. My teacher tells me to write something true, show how smart I am, and convince you that I am college ready. I can do that. Something true: I never again want to be inside a house as it is being demolished. Something smart: Education and money are twin sisters. The poor will never have an equal starting point as the rich and my intelligence is not in question. I am college ready: I've lived through the calm, disease, of the eye of a typhoon. Living in a dorm doesn't scare me. I learned English at a young age because my parents couldn't communicate except through me. I stayed after school to be tutored, not because I needed the help but because I dread every day going home to my tin house in the sun; the typhoon didn't make it awful, it just made it worse. We barely have passable internet, we have no museums, and any book taken out of a library turns to mold and termite fuel. I've always felt less capable than my mainland counterparts…until last summer when I met them. Last summer I visited Washington D.C., Gettysburg, and New York City, on a paid trip called Close Up. On that trip, intimidated as I was, I met kids whose parents went to college, whose houses were made of bricks, who slept in air conditioning, and I came to realize they are no better than me. I haven't had the same experiences, the same opportunities, but I know who I am and what I'll become. My circumstances have forced me from apathy, pushed me from ambivalence, at a young age. I will not suffer as a minimum wage worker like my parents. I will be better, stronger, smarter, and I will lift those who have raised me. Jessa Camacho is a member of the founding class of Million Dollar Scholars from Kagman High School on the island of Saipan (Northern Mariana Islands). She wrote this essay for college scholarship applications. She received a four-year, full ride scholarship, and now attends Central Washington University, where she is studying Information Technology. Her favorite food is lumpia.